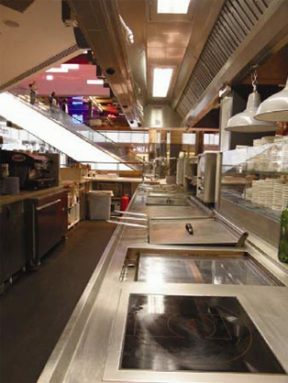 Kitchen Hood Fire Suppression Systems are advanced fire detection and fire suppression systems designed to provide fire protection in hoods and ducts of cooking appliances for restaurants and commercial kitchens. It quickly quells flames and cools hot surfaces preventing excessive damage to appliances, personnel and property while preventing collateral damage that could cause considerable downtime as well as expenses. SSS offers a a pre-engineered solution to appliance and ventilating hood and duct grease fires. The system is designed to maxi-mize hazard protection, reliability, and installation efficiency. Our systems have been tested to the UL Standard for Fire Extinguishing Systems for Protection of Restaurant Cooking Area, UL300, and Listed by Underwriters Laboratories, Inc. – UL approved and ULC approved. Our services include design and installation that is in accordance with the National Fire Protection Association standards, NFPA 17A Standard for Wet Chemical Systems, and NFPA 96 Standard for Ventilation Control and Fire Protection of Commercial Cooking Operations, and comply with all local and/or state codes and standards.